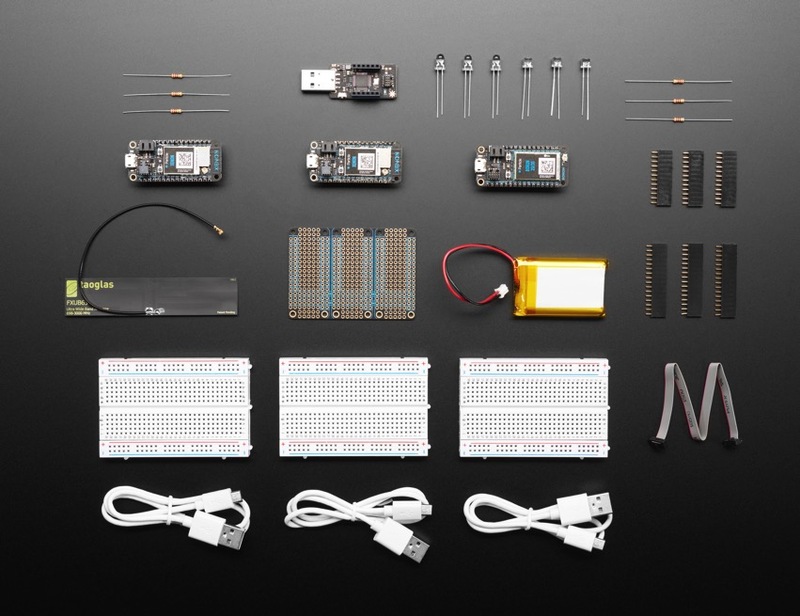 NEW PRODUCT – Particle Mesh 2G/3G Bundle – Full Starter Kit « Adafruit Industries – Makers, hackers, artists, designers and engineers! Woohoo, it’s time for a Particle Mesh party! So why not cater for connectivity with the Particle Mesh 2G/3G Cellular Bundle, a veritable smörgåsbord (yum!) to begin building mesh networking for your IoT project. Particle Mesh means you can create local networks that collect data, share messages, and connect to the Internet through a Particle gateway. Note that there’s also a Particle Boron with LTE support, this one is 2G or 3G only! The bundle comes with three mesh-ready boards: the Particle Boron 2G/3G, a powerful board that can act as a gateway between any 2G or 3G cellular network and your local Particle Mesh network, and two Xenons, the end points or network repeaters, so you can start to experiment with a multi-device Particle Mesh network. The included Particle FeatherWing Tripler, a Particle-branded Adafruit FeatherWing Tripler Mini-Kit, provides space to add-on up to two FeatherWing accessories. And, last but certainly not least, the bundle includes the Particle Debugger which gives you the power of professional debugging at a fraction of the cost. Using this accessory, you’ll be able to program Particle mesh-ready hardware over common interfaces like JTAG and SWD, using open source tools like GDB. Not only do you get the classic 2×5 cable but also socket headers for power, data, and even a bonus UART connection, very handy! All Particle Hardware is designed from the ground up to work with the Device Cloud; a powerful set of tools and infrastructure to build, connect, and manage your IoT fleet. Prototyping is free and Particle customers receive 10 free cloud micro networks which means one gateway (like the Boron or Argon) and up to 10 additional devices (like Xenons). Please refer to their pricing documentation for more information.